Home » Blog » News » Skype Visits. See you there! 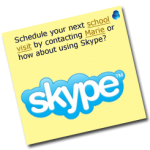 Now that school is back in session… I’m actively booking Skype visits. I did several virtual visits last year and had a blast! It’s a good alternative (and a lot less expensive) to a “live” author visit (but I am actually “live” during the Skype visit) If you are interested, or need more details contact my wife, Marie, at marie@rolandsmith.com to get on the schedule. I hope to see you this year! I’m the Reading Specialist at Cedar Lee Middle School in Fauquier Cty, VA.
Storm Runners is on our state list this year and we are using it with our 6th graders, and love it! Wanted to find out about skypeing with you. ← Puyallup Pies. Florida Reading Association.